The traditional Santa Marija Show was held at Villa Rundle Gardens, Victoria. More than 100 competitors took part in the two-day agrarian exhibition, displaying 2,700 items, including agricultural produce, livestock, poultry, cows, goats, horses, birds, wine, oil, honey, farm machinery and handicrafts. 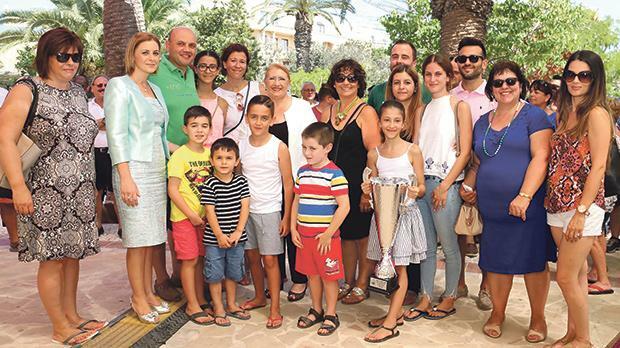 Over €8,000 in cash prizes and a number of trophies were distributed by President Marie-Louise Coleiro Preca, Gozo Minister Justyne Caruana and Parliamentary Secretary Clint Camilleri, among others. The overall winner was Ronnie Grech of Kerċem. Luke Buttigieg of Munxar placed second while Frances Mizzi of Xagħra came third. Grech (third from left) is seen with the President (sixth from left) and Gozo Minister (second from left) and with family members, including his daughter, who is holding the trophy.